Squidoo is a content website where you can build for free your own page, called “lens”, create your topic and earn money from it. This is also called “Revenue Sharing Site”, as some ads (generally Google Adsense) will be placed in your content page and the revenue will be splitted between you and Squidoo. You may find a lot of sites where you can share your content for FREE in this article, included some other popular “revenue sharing sites”, like HubPages , Xomba, InfoPirate, Triond or TrendHunter. Squidoo has a good traffic, an active community and their pages are frequently spidered by search engines. To get started you can go to Squidoo and sign up for free : here there is a lot of help to build your first “Lens”, for example adding affiliate programs. Once created your first lens, you can promote it in order to attract a good traffic : if you want to have some ideas, check the top 100 lenses here. 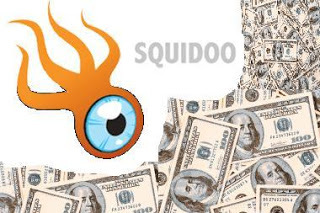 With your Squidoo Lens you can make money online, by let the site placing advertisements on your page and using affiliate links of any type. Squidoo tracks any earnings that you make from your Lens and allows you to receive payment trough Paypal. You can even opt to share your earnings with a charity of your choice. Another way to use Squidoo is promoting your blog or website in your Lens content. 4) promote Squidoo through their affiliate program : creating your own account and get your referral link . Have fun making money online with Squidoo!